Fingerprint scanners seem to be marking their presence everywhere lately. Let it be the office entrance, banks, stores, gyms, schools, self-service kiosks, or your smartphone, they are sneaking in our daily life. Being small, cheap and easy to install, they have made people to ditch their current systems for fingerprint scanners. From small business to huge corporations with multinational presence, are leveraging this technology to expedite their operations. Time is money and that fact is equally applicable on businesses of all sizes. Fingerprint scanners can be found accompanying doors for access control at larger facilities, while smaller stores and business use them for payments, point of sale, identification, etc. More or less, we are used to the fingerprint scanners around us, but knowing them further, like how they work, different sensor types, their cost, etc. will make us really appreciate these shiny little machines being tapped by millions of people every day. In simple words fingerprint scanner is an electronic device used for capturing digital image of fingerprint patterns. Fingerprints scanners come in different sizes, shaped, equipped with different sensor types and technology; depending on the usage. Access control is a common application of fingerprint scanners and access control fingerprint scanners come with networking capability to connect with a standalone computer or a computer network through wire or wireless means. On the other hand, a USB fingerprint scanner is only active when connected to a smartphone or a computer, which should be running a supporting app. Image: Two different types of fingerprint scanners. Left: USB Fingerprint scanner requires a PC or smartphone with supporting app to work. 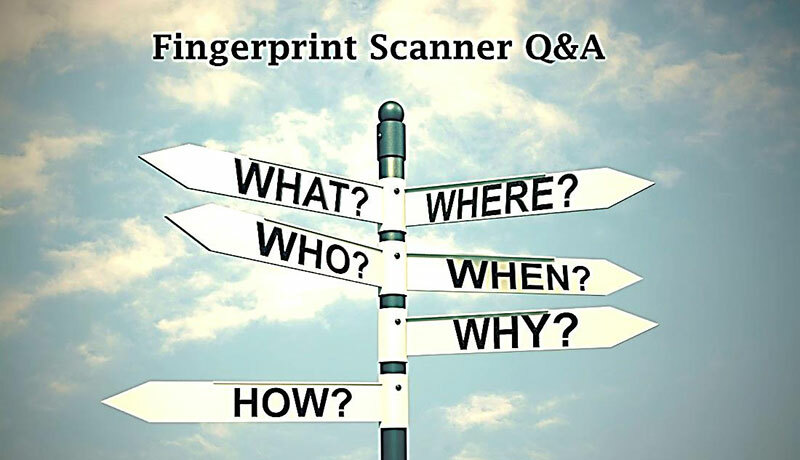 Right: Commonly used for access control, can scan and store fingerprints independently, can connect to a PC or network to communicate and export biometric data. Fingerprint scanners for access control often come with supporting software. Supporting software installed on a designated computer can communicate with fingerprint scanner to import data like clock-in and clock-out time of employees; can generate different reports and matrices, depending on the capability of the software. While access control fingerprint scanners have capability to scan and store fingerprint template without any assistance from an additional IT system, there are tiny scanners available in the market, which have no processing capability unless they are connected with a smartphone or a computer. They just scan the fingerprint and send it to the app, and then the app can perform further processing. Fingerprint scanners may employ different types of sensors to scan and generate the digital image of fingerprint patterns. Fingerprint sensors make use of different techniques to scan fingerprints, for example a sensor may be optical, capacitive, thermal, etc. When a finger is put on the scanning area, digital image of fingerprint patterns is read by the sensor. This digital image is pre-processed to remove unnecessary noise and enhance the image quality. This enhanced image is taken through fingerprint algorithm to identify unique points like ridge endings, bifurcation, short ridge, island, spur, etc. These details are called minutiae. Since there are a huge number of possibilities for the location of minutiae, fingerprints are theoretically unique. A biometric template is generated after post-processing the fingerprint image, which is stored in a database. Historically, fingerprinting has been used mostly with crime scene investigations and forensics. A fingerprint found on a crime scene was enough of proof to prove someone’s presence at the crime scene. Association with forensics and crime scene investigations also helped fingerprinting conspiracy theories to emerge when biometric technology was introduced for civil identification purposes. Anyway, before the information technology took over the world; fingerprint enrollment, storage and match were processed manually. Fingerprints were taken with ink and paper, and stored that way. This process was prone to errors and poor print quality. Live scan fingerprinting is the process of capturing fingerprints with electronic means, and without the use of ink and paper. Live scan is commonly used by law enforcement agencies and private facilities for identification, background check, criminal booking, etc. Live scan is much faster than traditional ink and paper based scan, and results can be obtained within a matter of hours. What are the common types of sensors? Fingerprint scanners make use of sensors to scan a pattern. These sensors come equipped with different techniques to read and produce image of the fingerprint pattern. Optical sensors capture the image of fingerprints with a specialized digital camera setup. This is the most common type of fingerprint sensors, which are widely available at cheap prices. Optical sensors pose shortcomings like quality of scan is impacted with dirty fingers and they are easier to be tricked than other types of sensors. Capacitive scanners make use of pixel array of capacitors instead of visible light, to produce image of fingerprints. Capacitive scanners are hard to forge because they cannot be fooled with fingerprint images. They are more expensive than optical sensors. Ultrasonic scanners use very high frequency sound wave to read pattern of fingerprints. Ultrasonic sound waves reflected form the fingertip surface are measured by the sensor and fingerprint pattern image is produced. Performance of ultrasonic sensors stay unaffected by dirtiness of finger surface as it doesn’t capture image like optical sensors. These sensors read a fingerprint pattern by measuring temperature variation in fingertip ridges and valleys. It requires finger to be moved over a linearly arranged narrow array of thermal sensors. They are small in size and require finger movement to measure fingerprint patterns. What is a fingerprint scanner used for? Fingerprints scanners are being used from unlocking doors to unlocking phones, but despite the area of application, the core idea is either identification or authentication of a user. How long does it take to scan a finger? It’s instant! In an ideal scenario, it takes less than a second to scan a finger. There are factors depending on scanner types and fingertip surface quality that may require multiple attempts to scan a finger, for example: dirty fingers can take time to scan on an optical sensor, on the other hand clean but wet fingers may require multiple attempts to be scanned on a capacitive scanner. Worn off fingerprints may also require multiple attempts to scan. How fingerprint data is stored? It is a common misconception that fingerprints are stored as images in biometrics systems and in case of a data breach, it can result in identity theft. When any modern system is designed, data security is a priority if it is going to serve crucial applications. Biometric systems process scanned fingerprints through sophisticated biometric and encryption algorithms to generate a template. This biometric template is just a mathematical representation of the scanned fingerprint, i.e. a sequence of binary data. It is nearly impossible to recreate fingerprint image with this data. This biometric template can only be used by the biometric system to perform a match or generate facts out of it, like check-in check-out times. These safeguards make fingerprints data storage secure and unusable even if a data breach occurs. How much do fingerprint readers typically cost? Mass production cut down the prices, and that is what exactly happening with fingerprint scanners right now. Increasing numbers of implementation made mass production of fingerprint scanners imperative and slashed prices. A fingerprint scanner’s price may depend on factors like brand, certifications, waterproofing, type of sensor, etc. A small USB fingerprint scanner can cost as little as $50 and a sophisticated ten finger scanner with live finger detection ability can cost $2500 as well. Increasing production and completion are expected to lower the prices further. Despite the popularity, fingerprint biometrics is still in its early phase in terms of market share. Traditional means of identification and authentication are still popular in many parts of the world. People have their misconceptions with fingerprinting probably because it has been associated with crime scene investigations and forensics in the past. These fallacies can be addressed by educating people about security standards employed by fingerprint biometric systems.